ride2monaco will be the 3rd ride2 Cycling Event, after ride2spa in 2012 and ride2monza in 2014. The previous two events have been pretty epic, and this one should be a worthy 'Part 3' to the trilogy. There's is nothing official about the event, we're just a group of friends who like cycling and F1 and getting together and seeing how far we can push ourselves, whilst raising money and awareness for worthy causes. The full 8 day ride, starting on Friday 20th May, arriving at Monaco at around 5pm on Friday 27th May 2016. When we get there we'll have a bit of an arrival party in Monaco. We'll be staying in Nice , with a train stop nearby to get to Monaco. A flight home will leave Nice on Sunday evening, going to Liverpool (£130), London Heathrow (£210) or Birmingham (£240). This is Day 1 of the challenge, Friday 20th May 2016, cycling just over 105 miles in 1 Day! We'll start at Silverstone at around 7.30am, and head south towards Portsmouth. If you've ever cycled 100 miles in day, you'll know how hard this will be, and definitely worth a few quid in sponsorship too. There will be a lunch stop mid-day to refuel and get the water bottles filled, with the aim of arriving at Portsmouth by late afternoon. Without a Support Team for the riders, ride2monaco wouldn't be possible! If you'd like to get invloved and support ride2monaco in any way contact us here. This includes everything needed to complete ride2monaco, plus the full F1 Weekend and your return flight home. It doesn't include airport transfer but public transport is available. This includes everything needed to complete the cycling part of ride2monaco, plus accommodation on the Friday night when we arrive at Monaco. Please note, this does not include accommodation on the Saturday night in Monaco, F1 tickets or your return flight home. Simply raise some sponsorship money, and we'll supply flapjack and other energy abundant food and water at the lunch stop. How long is the full duration of ride2monaco? The full duration of ride2monaco is 10 days. Starting on Friday 20th May 2016 and returning home on the evening of Sunday 29th May 2016. To take part, do I need to do the full ride? How much will it cost to join Team ride2monaco? Due to the size of our support team, places on the full ride2monaco Challenge are all taken. 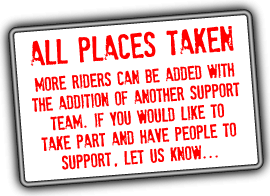 If you want to ride2 and can provide a support team yourself, then get in touch! Can I raise money for a Charity other than the one's selected? You can. Simply set up your own Virgin Money Giving or Justgiving page and we'll add your chosen charity to the Charities page and your amount of sponsorship to the Total Amount Raised on the ride2monaco Virgin Money Giving page. Do you have support vehicles? We'll have a van and support team to transport luggage between hotels, provide food and drink at pre-arranged places and help the team out if needed in an emergency, and to transport the bikes and other kit back from Monaco. How will we find our way to Monaco? We've used Smartphone apps and Garmins in the past. The routes are all on STRAVA, which you can 'Favourite' and then follow on your smartphone. The routes, as they stand, have not been fully checked, but to try and avoid cycling down motorways, we'll do our best to check them before the event! What would I need to arrange to take part? As ride2monaco is a totally non-profit event, you would need to make sure you have the right travel insurance to take part in a European cycling trip, along with a valid EHIC (European Health Insurance Card). Unfortunately we can't be held responsible for loss or damage to you, your bike or any equipment you have with you. We will have a few spares on the van, but spare inner tubes and gear cables should be carried by all cyclists, along with a multi-tool just in case. What do we eat during ride2monaco? We will have fuel stations at pre-arranged stopping points. These consisit of energy bars, energy drinks, fruit and anything else full of carbohydrates. Some breakfasts are provided by the hotels but we will have cereal and milk if not, and evening meals will need to be bought on the evening at the hotel or other outlets. • ride2monaco / Ride2 Cycling Events are 100% Non-Profit and are organised entirely by volunteers to raise awareness and funds for the charities shown on this website. • Cyclists should ensure that their bicycles are in a roadworthy condition with plenty of tread on the tyres and life left on the brake pads, etc. • ride2monaco is going to be a tough ride! Participants should make sure that their health is in a condition that allows them to take part in this event, and consult a doctor if necessary. Participation will be entirely at the participant's own risk. • By taking part, all participants confirm that they are happy to be in any photos or video footage that may be used to publicise ride2monaco. • ride2 Cycling Events reserves the right to amend the event at any time. By participating in this event you accept these terms and conditions of taking part and acknowledge that ride2monaco has no responsibility or liability for any loss or damage to you or your belongings and you take part entirely at your own risk. You also acknowledge and accept that ride2monaco or any of it's volunteers will not be liable for death or personal injury.